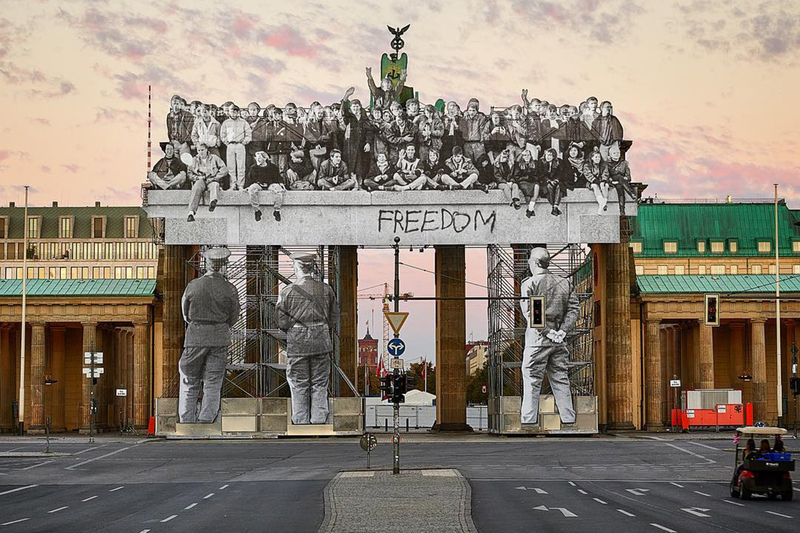 JR Commemorates the Fall of the Berlin Wall with a New Brandenburg Gate Installation! Walls have been an important topic for artist JR, by his own admission. 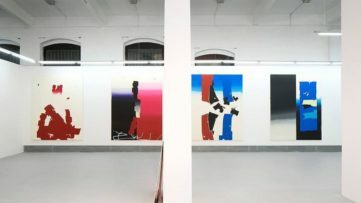 Several of his projects so far involved placing archival images on actual walls or their remains: the Face2Face and the Kikito projects on “walls that separate”, or Wrinkles of the City and the Destruction series for “the walls that disappear or are destroyed at a loss for the memory of a place or people. 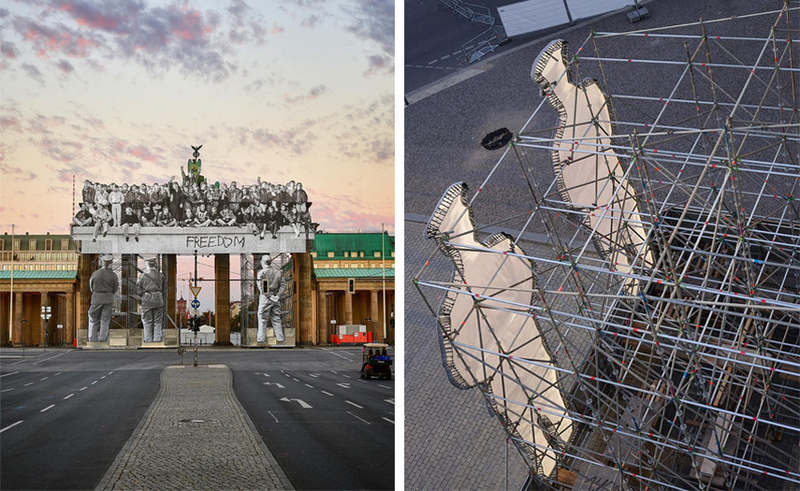 The Frenchman’s latest installation found its place in Berlin – on the city’s Brandenburg Gate, no less. It was created as part of the initiatives organized in remembrance of the fall of the Berlin Wall 28 years ago and in celebration of the reunification of Germany on October 3, 1990. If you’ve found yourself walking around the German capital these days, you could’ve noticed JR’s trademark 25-meter scaffolding which supports his work. This time, it was put up in order to paste old imagery onto the landmark; imagery made by Iris Hesse on November 10, 1989 during the fall of the Berlin Wall on this place, symbolizing the division, but also the reunification of Germany. On that day, thousands of people from both East and West parts of the city ran toward the wall and gloriously climbed over it. The Brandenburg Gate was part of a wall that represented the division of Europe following the failure of a mass murder ideology. It separated women and men who lived in two opposite systems of thought.The opening of this Gate has kindled a wind of freedom that has engulfed millions of Europeans. JR’s installation will remain in place for three days, so make sure you catch it if you’re around! Apart from his work on and about walls – we still remember his recent project done on the wall along the U.S.-Mexico border – this also marks JR’s second interaction with a historic monument. 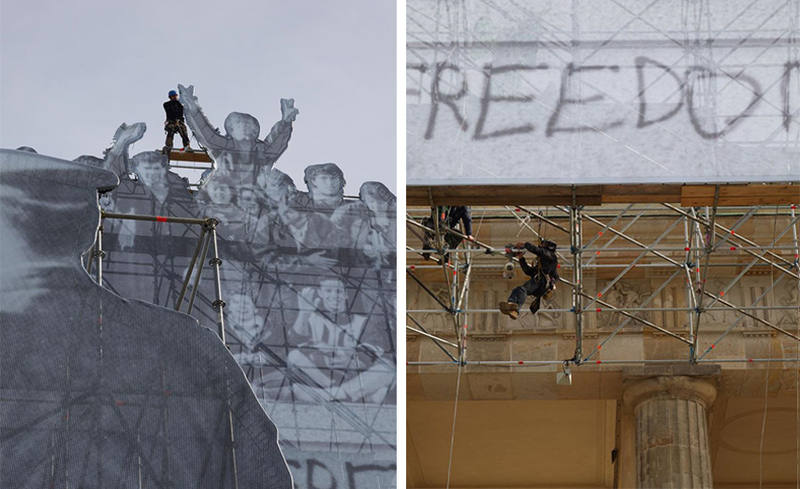 In 2016, the artist covered the Louvre’s glass pyramid with images of the museum itself, making it “disappear” and “blend into the building behind it” when viewed from an angle. 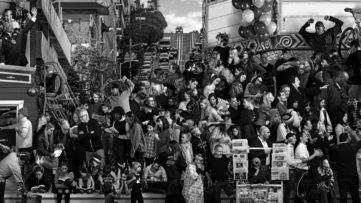 The photograffeur was also the maker of a project at this year’s Armory Show in New York, and was the subject of a solo show at Galerie Perrotin. His documentary film Faces Places, which he co-directed with the legendary Agnes Varda, was nominated for an Oscar. Last time he dedicated an artwork to Berlin was in 2013, with his Wrinkles of the City project. All images courtesy the artist’s Instagram.